There should be a way to focus on specific referrals based on certain criteria. The software has the referrals filtering feature which helps on changing the currently displayed referrals so that it becomes easier for you to focus and analyze. 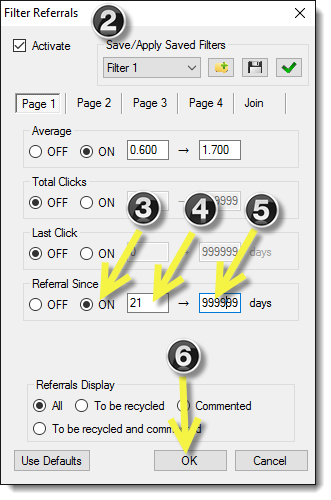 Also, it is useful if used with the Mass Action feature if you want to quickly add a comment(note), assign a flag, or mark To Be Recycled on a group of referrals matching certain filtering criteria according to your own recycling strategy. The general steps to activate the referrals filter, turn ON/OFF a filter(criteria), adjust the parameters of a filter(criteria), and so on. Let's see a simple example to filter the referrals by their average, we want to see only the referrals having average between 0.6 and 1.7, do so we follow the steps below. 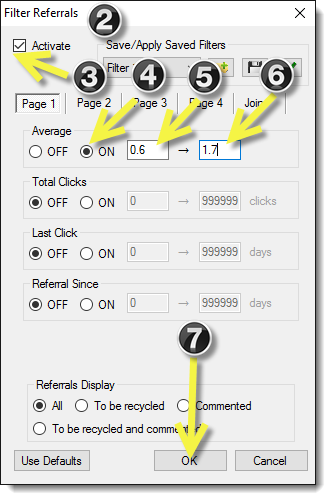 1- Press the Filter button on the left side of the software above the Referrals list. 9- Now we can see the Referrals list is displaying only the referrals who are matching our filter criteria, we notice also that the percentage of the referrals shown is lower than 100%. 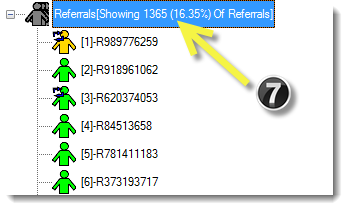 In our example, the referrals having average between 0.6 and 1.7 are 4784 (57.29%) of the whole referrals we have. In the above example, we have applied a simple single filter, what about combining another criteria to the above filter, for example, let's also show only the referrals matching the above average filter and at the same time having referral since date more than 21 days. To do so, follow the steps below. 7- Now we can see the Referrals list is displaying only the referrals who are matching our combined filter criteria, we notice also that the percentage of the referrals shown is lower than 100% and lower than the previous percentage when we were using only the average filter alone. In our example, the referrals having average between 0.6 and 1.7 and referral since date 21 days or more, are 1365 (16.35%) of the whole referrals we have. 8- Similarly, using other available filters we can combine third, forth, or more criteria to our filter to focus on only the target referrals we would like to show in the Referrals list.